Canadian engineering graduates are inducted to the profession in a ceremony called The Ritual of the Calling of the Engineer. The ceremony, and the Iron Ring that goes with it, remind the new engineer that their obligations to the public must come before commercial and personal considerations. Professional engineers are always under pressure - the pressure to do things cheaper and faster, faster, faster. Under that pressure, it is sometimes tempting to do things cheaper, or to cut a corner and save time. Corner-cutting doesn’t happen out of malice, but rather because the budget is blown and you need to build half a skyscraper with a quarter of the budget; or because you’ve been at work for twelve hours and you just want to go home. About half the time, no-one notices the corner was cut, and everything works out OK. The other half of the time, the bridge collapses, or the dam bursts, or the electrical board explodes, and the engineer is called to take responsibility for someone’s death. It’s true that other professionals can also kill people by honest mistakes, negligence or malice. Medical professionals are the easiest example. The thing is that a bad doctor can only kill a few people a day - engineers can kill a hundred and seventy-one thousand people at a time. Hence, The Ritual of the Calling of the Engineer. 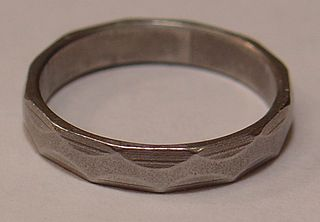 Engineers who pass the ceremony are granted a simple iron ring, worn on the pinky finger, to remind them not to cut corners; to put the public first, and their company (and themselves) second. It is rough as the mind of the young. It is not smoothed at the edges, any more than the character of the young. It is hand-hammered all around and the young have their hammerings coming to them. It has neither beginning nor end, any more than the work of an Engineer, or as we know Space itself. It will cut into a gold ring if worn next to it: thus showing that one had better keep one’s money-getting quite seperate. The ceremony supposedly involves the reading of a Rudyard Kipling poem, either The Sons of Martha or The Hymn of Breaking Strain. Of these, I associate more with The Sons of Martha, which is a fairly accurate tribute to the kind of work done by engineers. Namely: engineers are charged with building the infrastructure that carries the world, while maintaining constant vigilance, and with little expectation of public recognition of the role we play. The Ritual of the Calling of the Engineer has a US equivalent, the Order of the Engineer, which also grants an Iron Ring. The goal is the same - to remind engineers of their responsibility to the public. I sometimes think that Australian engineers need an Iron Ring. Just to remind us in our moments of weakness - when the budget has evaporated, or the deadline was yesterday - that our obligation to the public must be our over-riding concern.